Colorado potato beetle (Leptinotarsa decemlineata) is relatively small for a beetle but relatively large for a leaf beetle. Adults are ¼″ to 7 ⁄16″ long and about ⅛″ wide. The body is oval when viewed from above and dome-shaped when viewed from the side. The wing covers are pale yellow with five black lines on each side. The are no similar species in Minnesota. Prior to European settlement, the Colorado potato beetle was found only in Colorado and neighboring states. The potato was introduced into North America in the 1600s and began to be widely grown in the early 1700s. By 1840 the potato reached the insects home range. By 1859 the insect had switched to the potato as its preferred host, and by 1874 it had spread all the way to the east coast. It is now present across North America, Europe, and Asia. 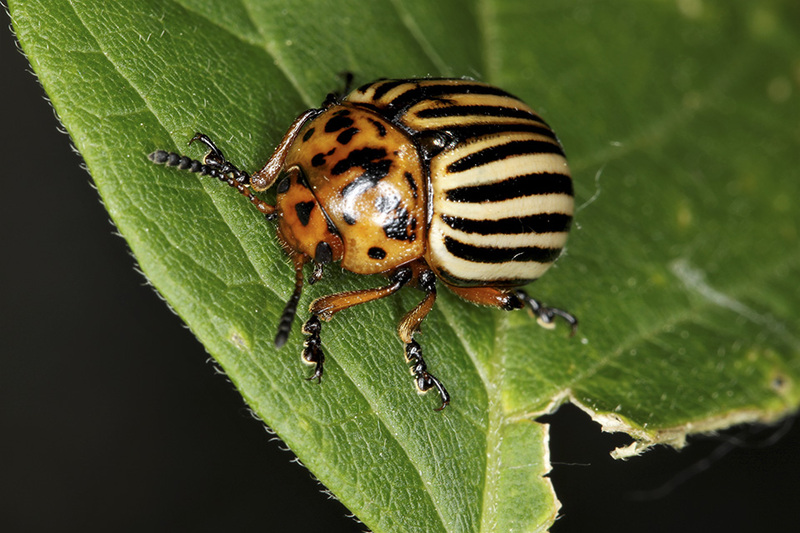 Colorado potato beetle is a serious crop pest to potato growers. The insect rapidly evolves resistance to chemical pesticides. Many insecticides that once successfully controlled the beetle are no longer effective. This entry was posted in Insects and tagged Colorado potato beetle, Leptinotarsa decemlineata on June 12, 2018 by John Valo.